RMG Messtechnik GmbH is an independent technology company in the Dalian-Energas-Group – powerful, flexible, customer-oriented. 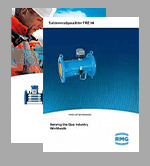 RMG is the European market leader in the gas measurement, analysis and reporting sector. We produce in Germany and also our software engineering and the customer service is placed in different locations in Germany. However, RMG is known globally and marks up constant growth in aspiring markets like Korea, China or South America.